Update 1/12/2014: I am now a contributing artist at Silhouette and you will be able to purchase the Silhouette cutting files for this project at the online store. I have posted a Silhouette tutorial for this project here. The cutting file is available here. There is also a solid heart tree cutting file here. 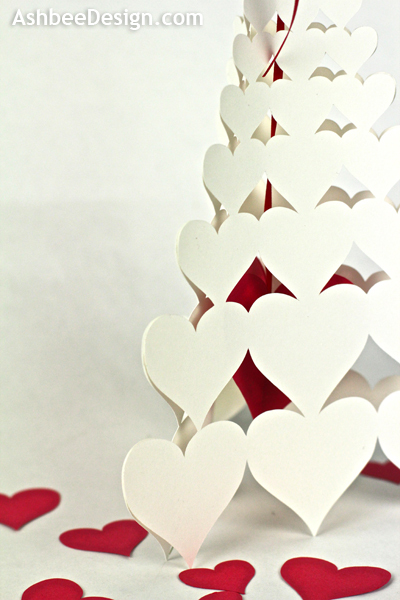 My valentine style leans toward simple, clean, and graphic. yesterday I shared Scandinavian hearts that influence my style. 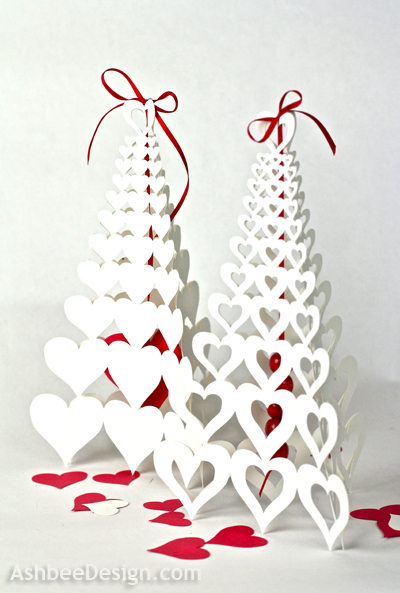 Keeping with the simple heart shape and repeating it, I designed two templates for the Silhouette cutting machine for valentine trees to be used in table or mantelscapes. 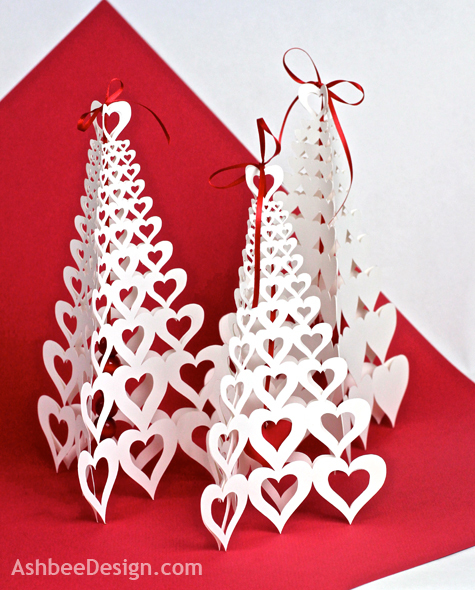 I love the dynamics of the positive and negative space plus the contrast of red and white. 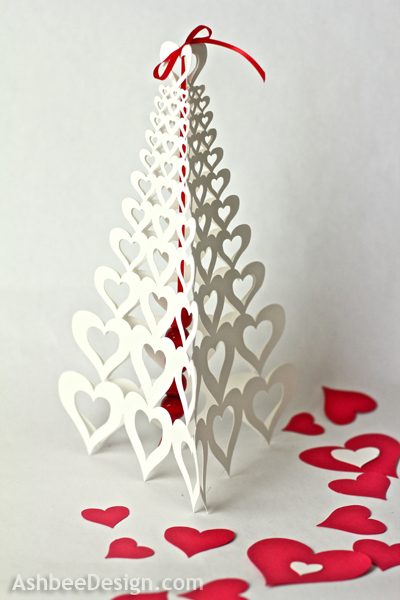 The first tree I designed was with the solid hearts. 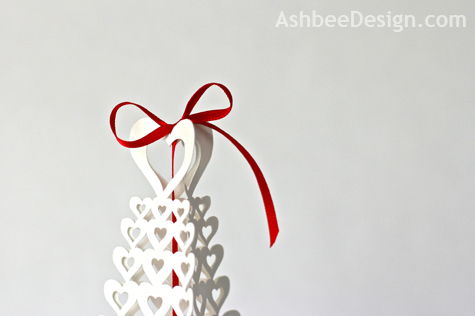 It has a three-dimensional heart made from three red hearts suspended on a satin ribbon in the center. David suggested making it a little more open so I made a second template with open hearts. I love the weld tool in the Silhouette software! 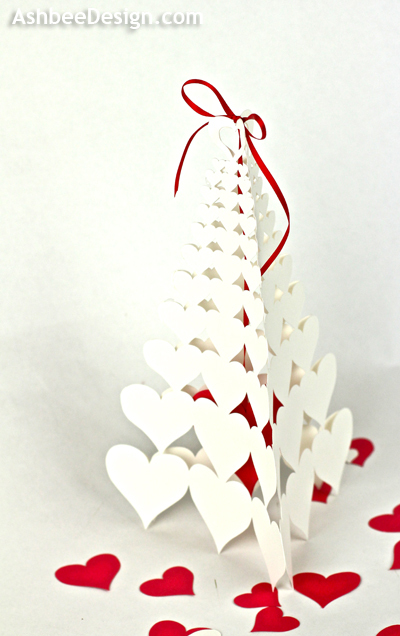 I decided to hanging red beads leftover from Christmas ornaments in the center of this design. And both are topped with simple red bows. Tutorial: I ran out of white cardstock. More is on order. I'll post a tutorial once I have supplies to make more and photograph them. It really was an easy project. Update 1/14/13: Tutorial is done and posted HERE! Beautiful! Can't wait for the tutorial! Very Creative Marji. Thanks for sharing. These are so beautiful. Thanks for sharing. Thanks so much for sharing with us at Someday Crafts! I will be featuring your project this evening on the blog! I just love your little love trees! Featuring tomorrow on my weekly wow's. FANTASTIC!! Had to come over to PIN!! Thanks for all the nice comments. I just ordered a red table runner so I can make a centerpiece on my dining room table with these. Just beautiful! Pinned. Anxious for tutorial, thanks, will return to see more of your talent! Thanks for the comments. Tutorial is up here. Send pictures if you make one. Wow these are BEAUTIFUL!!! I've never seen anything like this craft! Just beautiful! These are just beautiful! A perfect Valentine Decoration. thank you for sharing them with us at TTF. Have a happy day! They are beautiful. I especially like it with the red background so you can see the cut away hearts.